Nancy Wexler, HDF President, adds yet another incredibly well deserved honor to her long list of prestigious accolades! 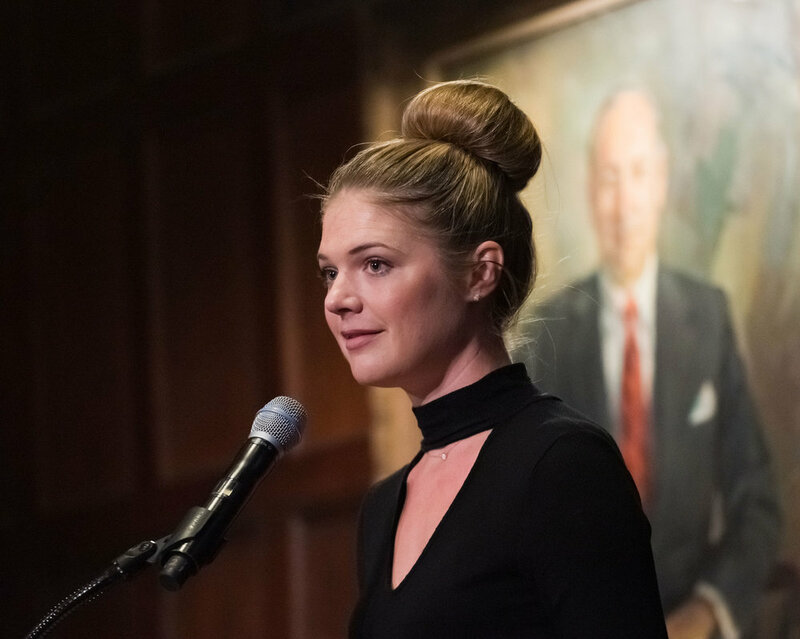 She was chosen to receive the 2019 Double Helix Medal for her extraordinary work leading to the discovery of the location of the gene that causes Huntington’s disease. Learn more here about this wonderful honor! Congratulations to Nancy for this wonderful recognition of your work to find treatments and cures for HD!!! We are thrilled to let you know that PBS stations around the country are airing the Woody Guthrie All Star Tribute Concert. This concert at the Hollywood Bowl was the very first fundraiser for what is now Hereditary Disease Foundation. You’ll see never before seen footage of this rare and historic event from 1970. As an added bonus, HDF will receive a portion of the proceeds from the sale of each DVD of this historic concert. Purchase here. Woody Guthrie, America’s greatest folk singer, died of Huntington’s disease several years before this tribute concert was filmed. 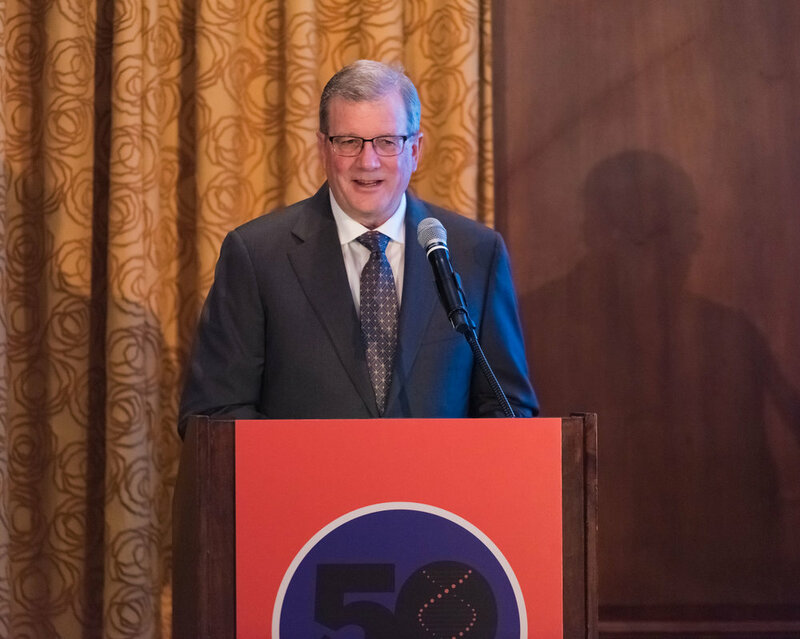 Over the past 50 years, we have made many significant discoveries about HD, and we are now celebrating the first gene therapy which promises to slow or even reverse HD in its tracks! Woody Guthrie continues to inspire us. His music and memory live on forever. Don’t miss this amazing concert. Check your local listings for airtimes in your area!!! Learn more about this exciting event on PBS . Read PBS’s press release. Letter from Roche with important updates to the study design of the global Phase III GENERATION HD1 study to evaluate the efficacy and safety of the investigational medicine RG6042 for Huntington’s disease (HD). 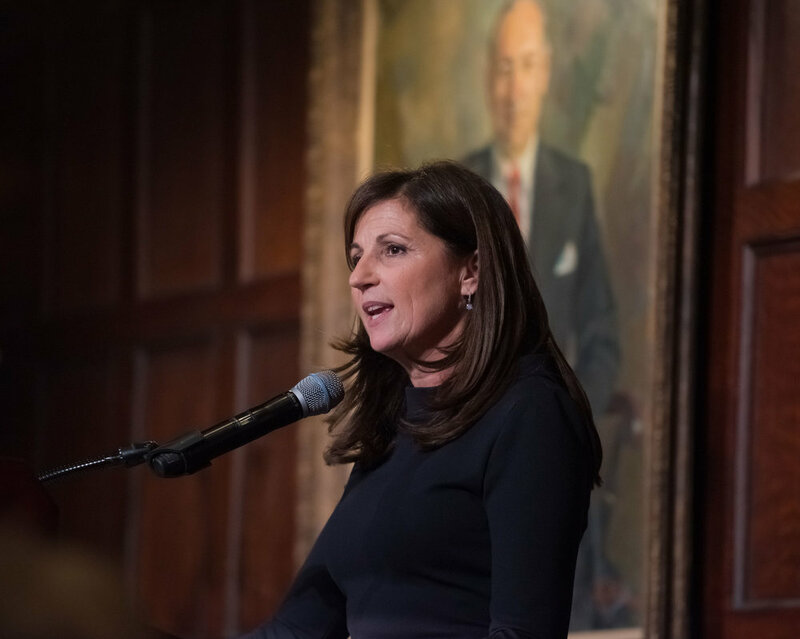 Read our March 2019 Newsletter now as we celebrate Women’s History Month and pay a special tribute to the amazing women of HDF. Listen to Kate and her husband Justin – “The Miners” - perform. Read our February 2019 Newsletter now to meet Joan Steffan, one of the top researchers unlocking the secrets of HD! Watch the full Award presentation. We are excited to share with you this letter from Roche summarizing recent updates about the RG6053 Huntington’s research program. We are now accepting Letters of Intent for Grants and Postdoctoral Fellowships. We invite you to look at our “Funding the Future” page and apply! The Letters of Intent are due by February 1, 2018. We’re excited about the beginning of a New Year and the promise 2019 holds for dramatic advances in HD research. Great things are happening…brilliant minds are at work. With your support, we will continue to push until we push HD out of the normal lifespan. Momentum begins with a moment. This is our magical moment…together we will make it happen for our families and for the future. Read more in our January 2019 Newsletter. about his work developing antisense therapeutics for neuromuscular and neurological diseases. His pioneering work brought us the world’s first approved treatment for spinal muscular atrophy (SMA). In 2005, Frank started a program to develop antisense therapies for Huntington’s disease. IONIS-HTTrx is designed to treat patients with HD and is the first and only drug to demonstrate reduction of the neurotoxic abnormal huntingtin protein, the underlying cause of HD, in patients. Ionis is partnering with Roche for phase 3 of the trial, which is set to begin in the U.S. and abroad soon!! This is a groundbreaking advance for the field of HD! Click here to watch in full to Dr. Bennett’s October 22, 2018 Symposium Presentation. Roche/Genentech announce the locations, including 20 sites in the U.S. and 6 in Canada, for their phase 3 study - called GENERATION HD1 - to test efficacy of the huntingtin-lowering therapy RG6042. This study is open and currently recruiting! This will be a 2-year study in people with early diagnosed HD, involving monthly spinal injections to deliver RG6042 or a placebo, as well as clinical tests and scans to understand the effect of the drug on HD symptoms. Around 660 people age 25-65 will be recruited at approximately 90 sites across the world. With love from our Hereditary Disease Foundation family to your family! “This is a magical moment. This is a moment when discoveries are going to really translate into better medical practice,” said Dr. Shirley Tilghman. A rapt audience listened intently as Dr. Shirley Tilghman, president emerita and professor of molecular biology and public affairs at Princeton University, spoke about how genes are organized in the genome and regulated during early development. A member of the National Research Council’s committee that set the blueprint for the United States effort in the Human Genome Project, she was also one of the founding members of the National Advisory Council of the Human Genome Project for the National Institutes of Health. 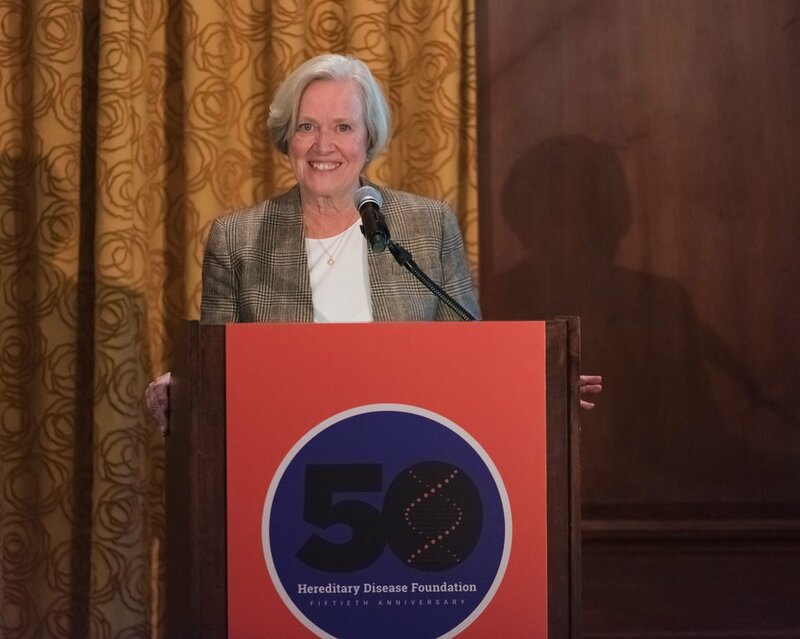 Dr. Tilghman is a world-renowned leader in the field of molecular biology whose brilliant scientific career as a mammalian development geneticist has advanced our understanding of Huntington’s disease and other disorders. Click here to watch in full to Dr. Tilghman’s October 22, 2018 Symposium Presentation. Research has taken a quantum leap – and with the first global clinical trial in HD poised to begin phase 3, we believe that the cure for HD is on the horizon. The Foundation’s 2018 Year in Review addresses this phenomenal breakthrough. Together we can vanquish this disease and impact other brain disorders affecting millions of families across the world. We've received a 4-star rating from Charity Navigator, which means we're accountable, transparent, and financially healthy! Check out our Charity Navigator profile to learn more! 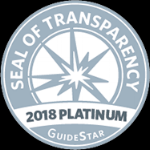 We also reached the GuideStar 2018 Platinum Seal of Transparency. See our GuideStar profile. We're committed to the highest level of transparency! 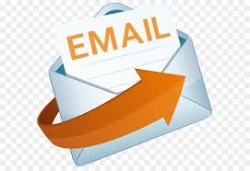 Please be sure you're on the HDF mailing list to receive the most current news and updates from us! If you don't already get emails from us, it's likely we don't have your current address. Sign up here. Today is Giving Tuesday! Your gifts - no matter how small - have a tremendous cumulative impact on the research we are able to fund. Every penny counts!